Apple's retail store unit has been generating some news over the past few days, so we've put together a roundup of some of the more significant items to summarize the latest developments. - Apple opened its new Palo Alto store on Saturday. The new store replaces the company's previous downtown Palo Alto store that had typically been considered the company's "home store" and was occasionally visited by executives for major product launches. 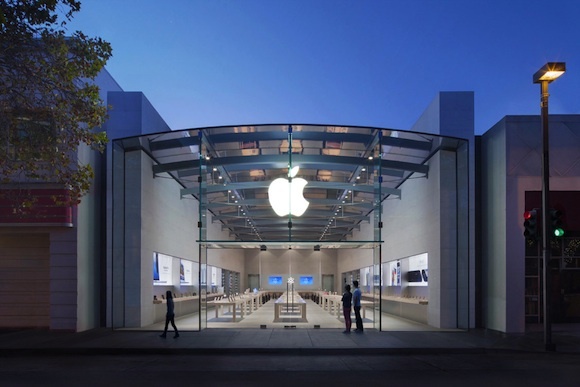 That store, opened in October 2001, was one of the first in Apple's retail chain. Apple CEO Tim Cook was on hand for the opening of the new store, which is roughly 50% larger than the original one and is one of the first of a new prototype design based on the Upper West Side store in Manhattan. Houston's Highland Village store opened earlier this year with a similar design, while the company is also using the concept for a replacement store in Santa Monica, California. - As the massive Hurricane Sandy approaches the Mid-Atlantic/Northeast coast of the United States, Apple retail stores are making their own preparations. 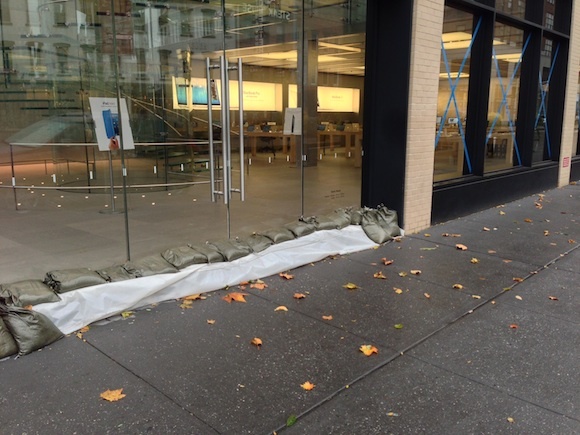 Business Insider shared several photos from CNN producer Jonathan Wald showing Apple's subterranean Fifth Avenue store in Manhattan with sandbags piled in front and display products wrapped in plastic. ifoAppleStore notes that at least 35 Apple retail stores are located within the landfall prediction zone, and with many areas shutting down in advance of the storm it seems that Apple will be temporarily closing at least some locations from this group. 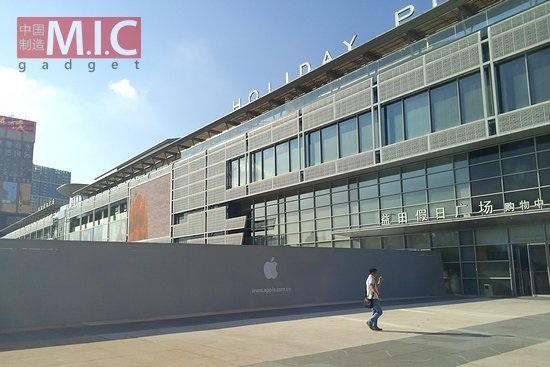 - Finally, in line with Apple retail chief John Browett's announcement at the opening of the latest Beijing retail store earlier this month, Apple will be opening its new Holiday Plaza store in Shenzhen, China on Saturday. The location is notable as Shenzhen is the hub for much of Apple supply chain for its products, with Foxconn having massive facilities in the city dedicated to assembly of iOS devices. The city is also a hub for the counterfeiting industry and is the main point of entry for scalped products coming across the border from Hong Kong. The sandbags I get, but what help does a bit of tape on the windows provide? The photo of the Palo Alto store is beautiful. I remember when there were no Apple stores, and Apple products were relegated to the backshelves in electronics stores. Microsoft/Windows fanboys would deride us Apple computer owners. Nowadays Apple stores are so busy you can hardly move around in one while shopping. Now that would be appropriate architecture for Apple stores: made out of aluminum and glass, and then wrapped in rubber and and plastic film to keep them from getting scratched and broken. Omg I hope apple is okay, I love apple products so much they better not get hurt!!!! I hope the flagship store won't get damaged, I love to visit dat one. What are you, some kind of troll? Where is the down vote button? Seriously. His post is about how far apple has come. The article is about the opening of 2 Apple stores with a little tie in about the hurricane preparation of Apple stores on the east coast. Who cares how he "spins it." Apple HAS come far. Even in consumer perception. In my early computing days, I was a total PC fanboy and bashed Apple computers. But but since the iPhone drew me in to Apple in 2007, I took notice of the products Apple offer and quality that goes into them... hardware and software wise. The same is true in what you quoted. Apple has gone from being a 3 foot display in the corner of CompUSA (remember that place?!?) to having stores with insane traffic that make more money per square foot than any other retailer. His comments were VERY relevant to the article! Get off of your high horse!